Blues and roots radio review. Here’s a nice review of our album by our good friend Les Ray. his radio show is now on Blues and Roots radio worldwide. 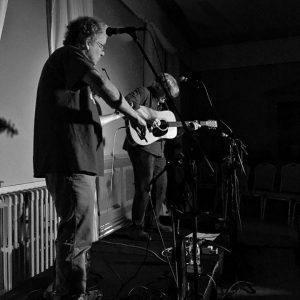 ‘Miner’s Eyes’ is the second CD by this duo from Cambridge and Bury St Edmunds, and differs from their first – ‘Papers in my Shoe’, released in 2015 – in that it is built around their own compositions, whereas the previous one predominantly contains their versions of traditional songs and tunes in a cajun and bluegrass style. 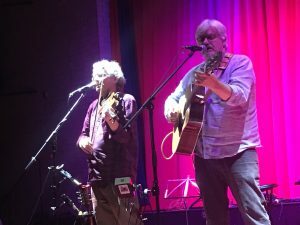 What the two albums have in common is very pared-down, simple (in the nicest sense of the word) arrangements, with just two voices, Gary Woolley’s guitar and Matt Kelly on fiddle, viola or mandolin: very much what you hear here is what you get when you see them live. How to sum up this CD in a few words? Fine songwriting, excellent musicianship, delightful harmonies. I couldn’t review ‘Miner’s Eyes’ without mentioning its very striking cover, the picture of a miner called Lee Hipshire by renowned US photojournalist Earl Dotter. Gary explains how they came to use the photo: “After explaining to Earl who we were and why we wanted to use the photo he agreed we could use it as long as we sent four copies to him, one for him and the rest for Lee’s surviving family. We had an initial email from Earl to say he really loved the CD but in October we received an email from Lee’s son to say he loved the music and it had helped them a lot recently as their mum had also passed away”. Here we are in action at Thetford Folk Club. Lovely gig with Thursday’s Band and Dusky Sunday. Lovely attentive crowd who appreciated the songs . What a lovely album. It’s simple (in the best sense of that word). Well crafted songs performed with great commitment and musicality. Well done lads. We are getting some lovely comments about the album from the radio community. We have a few gigs lined up in the coming weeks. 16th November, Thetford Folk Club. 29th November, Loughton Folk Club. 5th December, Johnny Wrights Blues Session, The Brook, Cambridge.